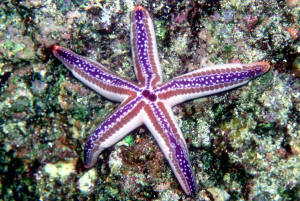 Phataria unifascialis (Gray 1840), the Blue Sea Star. Hi guys. Long time follower of your site. Yesterday my friendly roommate noticed that the water level in my refugium was a little low. We have been chatting lately about my 75 gallon with a 30 gallon refugium marine tank. I guess he was feeling helpful and "in the loop", so he decided to add a gallon of Harris Teeter drinking water to the tank. On the label of the drinking water it says, "Prepared by carbon filtration, microfiltration, and ozonization for purity. How worried should I be? I have a bunch of sps and xmas tree worm rock that has thrived for over 3 years. My LFS is closed until Tuesday which is where I usually purchase salt water. Should I just wait and then do a water change on Tuesday, or will the aquarium to a relative, murder my roommate, and suffer the consequences? I made up 10 gallons of makeup water on Sunday for a water change I was planning on doing later on in the week. There was still maybe a gallon left in my tote from the last water change. I tested the salt level on Monday and also decided to check for ammonia and I actually found some. Its somewhere on the color card between .25 and .5. I am using R/O water from the Culligan man and reef crystals. Is this water safe to use for a water change? I found the ammonia after I added that 10 gallons of r/o and salt to it and let it sit for a day. No chemicals are used in the area I have my totes. I noticed that I have salt gathering and sticking to my heater I have in the tote is this a problem? Now running a 125 gal FOWLR/LS. I'm using a 90 GPD Spectrapure RO/DI unit for my "top off" and saltwater changes. Read a lot about preparation prior to adding salt but what do I need to do with this low pH/Alk water for daily top offs? I've taken notes, please tell me if this is correct !!! 1 - aerate for 12-24 hrs. 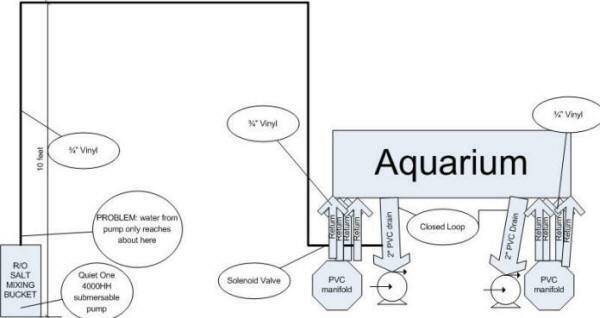 2 - Add sea buffer, is there a difference between Aquarium Systems vs. CaribSea? Add appropriate amount to buffer to 8.0? Aerate for an additional 24 hrs. This freshwater can now be used for my "top off" needs? 3 - Later, add salt for regular water changes. <Yes. You may want to read articles/FAQ's here. I'm jumping over here from the WWM Forum to maybe get an answer to my question and a potential solution. You have been tremendously helpful in the past and I appreciate the service you provide. I've read through much of the discussions on PH, alkalinity, and calcium at WWM and I believe I have a fairly good understanding of it. However, after implementing what I thought would be a relatively easy way to keep my system alkalinity stable, I find myself with a small problem that I can't seem to figure out. I'm having a problem keeping my dKH stable without adding buffers to the tank. I want to be able to keep it buffered with the ATO water. I measure my dKH regularly and I'm having trouble maintaining anything above 8 and it occasionally falls to 7 dKH. even with massive amounts of buffer in the ATO water. checked my premixed salt water and it's at 8dKH. I checked my FW ATO tub and it's at 21dKH. I use Sea Chem powdered products (Reef Buffer & Reef Builder) in my ATO water to buffer the tank, but I never really know how much to add or how high I need the dKH to be to keep the tank alkalinity up. I perform weekly 10 gallon water changes. I recently changed from Reef Crystals to SeaChem Reef Salt and that seems to be helping a small Cyano battle I've been wagering for the last year. I just couldn't completely knock the stuff out, so I changed salts to see if it helped. It seems to be helping. The Cyano is retreating again, not that there was massive amounts of it....but it's ugly. The LR rock looks noticeable better too after only 4 weeks. What I do not understand is how the dKH can be so high in the ATO water and it seems to be doing nothing to keep the tank dKH level from dropping. My ATO uses about 1.5 gallons per day. This has been an ongoing issue since I set the system up. I'd be happy to keep the dKH stable at 8 or 9, but I don't seem to be able to do that without adding buffer directly to the tank occasionally. All of my RO/DI water is aerated for several days before use. The only thought I've had is that I need to start buffering my premixed salt water to a higher dKH as well as the ATO water. <What you need to do here is stop. Other than salt, and enough buffer in your top off water to get a pH of 8.2 - 8.4 and a dKH of about 7 - 8, stop adding chemicals to your system. Then, measure your dKH, pH and Ca both morning and night for a few days. record your readings. If your dKH drops below 6, add just enough buffer to bring it back. You should know what your calcium demand is, ad well as what your dKH wants to naturally rest at.. The key thing to realize is, if your Alk wants to stay at 7, let it. Happy Friday. Many of you have helped me work through the crash of my tank last September. By pure luck and good fortune, I finally figured out how it happened. I have a Tunze auto top-off system. The outlet hose for the ATO is clipped to the top of my sump--I'd say 12" high off the bottom of the stand. I recently vacationed in Alaska and went through my normal protocol. I filled a Brute trash can with 30 gallons or so of RO/DI water for top off, and threw my Tunze pump in there. As luck would have it, I did one last check of my system before I headed to the airport and I noticed that even though my Tunze ATO pump was not cycled on, there was a slow trickle of water from the ATO hose outlet. So, it appears that a siphon is created once the ATO pump starts, which isn't broken when it cycles off. either my return pump or my HQI ballasts, which tripped the circuit breaker. How can this happen if the pump sits below the hose outlet? I'm thinking that it's because the trash can is so high, that the height of the hose coming over the top of the trash can overcomes the 12" or so height difference between the position of the outlet hose and the floor where the pump sits?? I am heading to the beach for a week at the end of August, so I need to sort this out. I was considering buying a large shallow tub that is no higher than the height of the outlet hose. I thought this was impossible--that you couldn't have a siphon if the outlet is higher than the inlet. My 135 G Reef tank loses a lot of water due to evaporation. I add a fair amount of RO water to top it off weekly. couple of places where they recommended adding something to keep the PH up. Also, how can I be sure that my RO unit is working properly (I have the Coralife Pure-Flo)? Is there something I can use to test the RO water? I was reading about TDS testing but wasn't sure if that was necessary. I'll also look into a TDS tester. Mystery Water Loss 9/4/08 Hi Crew!!!!! Great website, it has helped me out a great deal, hats off to you guys and gals. I have a 75 Gallon Reef with a 20 Gallon sump, it is a new setup and was running with just saltwater for about a week without any noticeable water loss. Since adding my 28Kg of cured live rock and 20kg live sand and switching on my Tunze 9010 I have noticed a water loss of about 1 Gallon over a 12 hour period, I do not think that it is all due to evaporation because as I understood if saltwater evaporates the salt from the evaporated water would remain in the tank and the salinity would rise? I am having the opposite, my salinity is slowly going down, I have checked all piping and bulkheads, I can not even find a drip or even a wet patch. I have not even started to use my light fixture yet (Arcadia twin 150watt metal halides), so it can't be excessive evaporation, can it? My tank parameters are as follows: SG 1.024 - 1.026, PH 8.24, Temp 25.5. I really can not work this one out, any ideas that you may have would be very much appreciated. Evaporation Rock 3/22/06 Hello, You all are the best! <Hello! We aim to please> I have a 60g cube FOWLR and I recently added a 1/5hp chiller which successfully brought the temp and the evaporation down. Evaporation was one gallon a day and is now down to half that. <That is a decent reduction, I wish I had that.> I want it even less. I do have live rock sticking out of the water right under the halide. Do you think this is working like a wick and accelerating the evaporation? <It could be, but I don't think so. However I would make every attempt either to control that evaporation anyway (How about an auto-drip?) but either way you should try to move that rock so it doesn't see air. Desiccation is never a good thing for long periods of time.> Thanks for your response. <No problem, have a great one. Jen S.> Sid. Automated water changes Hi MacL, <HI! Timon> I live in tropical Thailand and the temperature of the room where my refugium and sump are located will vary greatly depending on if the sun shines that day so I am worried that the evaporation rate will vary a lot from day to day. <It might be a problem for corals as well as your tank temp is bound to fluctuate a bit> I have learned today that I can use a conductivity controller that can control a pump based on pre-set minimum and maximum conductivity values. Do you think this is a good way to make up for evaporation? How do I top off water in my Nano Reef? Hi Crew, << Hi there >> I have a 10 gallon saltwater tank. I replace 1 gallon every week. Since the weather has heated up the tank temperature started climbing into the low 80's so I got a small fan which keeps it around 78. But now I get a lot of evaporation, as much as a gallon a week. So I need to add a gallon of new unsalted water. Iodine use Hi I have constructed a 500 gallon system for cryptic filter feeders. There is an algae scrubber and a skimmer. I will be importing tunicates, sponges, Dendronephthya, file clams... water movement is via a fast current generated by a large water lift into the scrubber, and a Wave2K. The system has three tanks and two refugia, so that I can isolate and experiment. There is an automatic top off unit for RO water. My question is- is there any problem (other than the controversies about using iodine at all) with putting the iodine in the freshwater top off tank? This would allow continuous infusion. Also, if no problem, can I also add two part alkalinity/calcium supplement to the same reserve with no interactions (i.e. does iodine precipitate on calcium carbonate)? - Shut-off Switch, Follow-up - Hi again Crew, I was able to locate a few vendors who sell such a switch, but I guess my real question is: Is this something I should spend the $$ on? Does this offer me some protection against overflow or is it prone to sticking and causing more problems then not having it? Have any of the Crew used this or know about them?